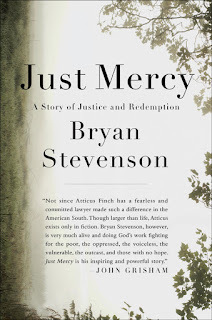 Summary (from the back of the book): Bryan Stevenson was a gifted young attorney when he founded the Equity Justice Initiative, a legal practice dedicated to defending the poor, the wrongly condemned, and those trapped in the furthest reaches of our criminal justice system. One of his first cases was that of Walter McMillan, a young man sentenced to die for a notorious murder he didn't commit. the case drew Stevenson into a tangle of conspiracy, political machination, and legal brinkmanship--and transformed his understanding of mercy and justice forever. 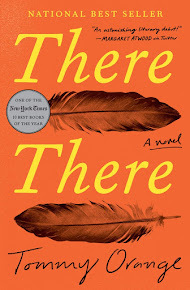 Review: This book is so many things: inspiring, frustrating, anger-provoking, and hopeful. This book was the recent "Santa Barbara Reads" choice and now I am kicking myself for not going to hear the author speak when he was in town a few weeks ago. This is the story of Bryan Stevenson's experiences working as a lawyer in Alabama from the late 1980s to the present. He takes on mostly death row cases, men, women, and children (yes, children) who have been either wrongly accused or who should not be sentenced to death (mental impairments, their age or circumstances). He certainly doesn't win all his cases and many of his clients were executed by the State of Alabama. However, reading about the cases, the attitudes of judges, lawyers, DAs, and the public is fascinating and frustrating. How can people be so cruel? As someone who is against the death penalty in all cases, to read about innocent people who are on death row is difficult. To read of executions done on a 1930s electric chair (the chair was made of wood, for goodness sakes) is horrifying. Then to realize there are people out there working day and night to try to fix the wrongs is inspiring. What I try to take from books like this is that there are good people out there, fighting to right the wrongs. Too bad they have to work so hard for so little. That just seems wrong.